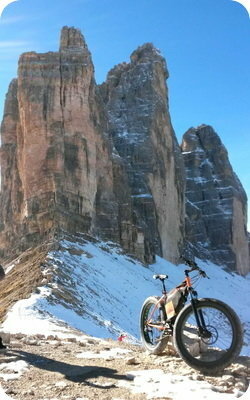 THE E-BIKEDOLOMITI CIRCUIT - The territory recharges you ! The e-bikedolomiti circuit, part of the "Dolomiti e-bike mobility" project provides a series of bundled services oriented towards cycling and sustainable e-bike mobility; it manages a network of specialised operators in the tourism and hotel sectors for the development of electric bicycle tourism in the Dolomites and throughout Italy. The primary goal of the circuit is to allow visitors to discover those particular routes off the beaten track, packed with emotions and local environmental and cultural content. Our tourist packages are designed and geared to participants of all ages, regardless of their physical and athletic preparation, to combine a travel experience in the Dolomites with other top tourist locations in Italy, providing exclusive and alternative routes to the standard programmes, in order to guarantee our guests new emotions, sociability and enormous enjoyment during their time with us. It is possible to choose circuits of one or more days with all inclusive guided tours created exclusively by us, or simply rent an e-bike or e-Fatbike to ride around the various locations with breathtaking views as you wish and at your own pace. The various affiliated charge centres are distributed throughout the territory to guarantee complete autonomy of your e-bike battery and therefore maximum mobility in all conditions, without having to worry about running out of "fuel". If you love the outdoor life and contact with nature, if your curiosity gears you towards discovering enchanting locations, if you wish to admire the Dolomites in all their beauty from an exclusive viewpoint, e-bikedolomiti is the solution for you! Send e-mails to this address: ebikedolomiti@gmail.com or contact us using the numbers below to obtain the information you need and to plan and book the next exciting emotion in your life! PEDAL WITH US AS YOU WISH AND AT YOUR OWN PACE !